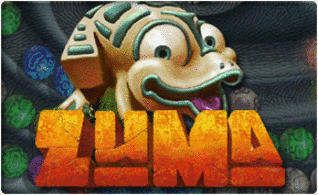 Now Zuma Deluxe is a Match 3 type of video game that I think is definitely a force to be reckoned with. I first played this game a few years back when I was still in college. I stopped playing the game when things got busy with my thesis but I didn't bother to uninstall the game, figuring I would just finish the game later on. I eventually forgot about it until yesterday. Imagine my surprise when I got home to find my dad playing the game on my PC! Then my mom followed suit and when she did, I really found myself wondering what was up with the game. My mom dislikes computers and anything relatively techie and she only used the computer to type up documents or print out photos when she had to. So I played Zuma Deluxe again and found out. 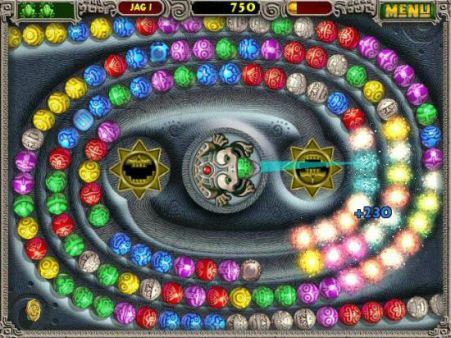 Zuma Deluxe is an interesting Match 3 game where you shoot out colored balls from the mouth of a comical-looking stone frog in the middle. 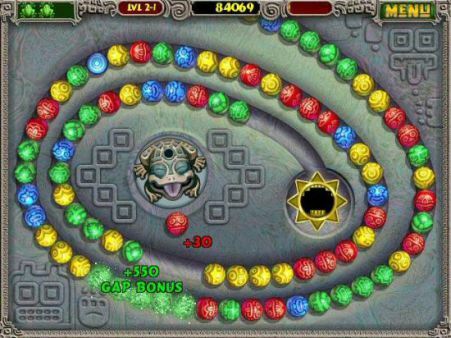 There is an Aztec-like theme and feel to the game, which is made clear in the sound effects each time you make a string of three or more colored balls. The premise of the game is simple: just aim your frog at the balls filing in from a corner (or two) of the screen that are similar in color to the one that's in your frog's mouth and you're all good. You start out with just a few basic colors at the beginning, but after you scale the first few stages, a new color is added to the gameplay. You then have to go through the same puzzle tracks with these additional colors. Zuma Deluxe also has some interesting power-ups. In order to activate them, you must hit these power balls in a sequence before the power-up symbol disappears. These include the Slow-Down ball, which slows the rate at which new balls are introduced into the puzzle; the Backwards ball, which reverses the flow of the balls to give you more time to hit them; the Accuracy ball, which gives your shots more power and accuracy (no duh! ); and the Explosion ball, which is technically a bomb that will explode once you hit it. Zuma Deluxe is fun and addictive. I wouldn't go so far as to say that it's totally unique because there are already a lot of similar games that belong in the same genre. However, it is a very easy game to catch on and play with--as demonstrated by my parents who have, by the way, already finished the entire game, all in a matter of a few days! The degree of difficulty as you level up is also apparent in how each puzzle is structured and lay-outed in the progressing stages. Plus I found the sound effects to be really fun, too. Really gets you in the mood for some serious Aztec Match-3 action. The only bad thing about Zuma Deluxe is that the puzzles are repetitive. Although they are creatively done, there are only about a few dozen unique maps that you will go through before being looped back to the first one. Even though you still progress in the stages, the only change is that you have one more color to deal with as well as a greater number of balls that come hurtling towards you at faster speeds. It would have been a better gaming experience if there were more unique stages in the game. 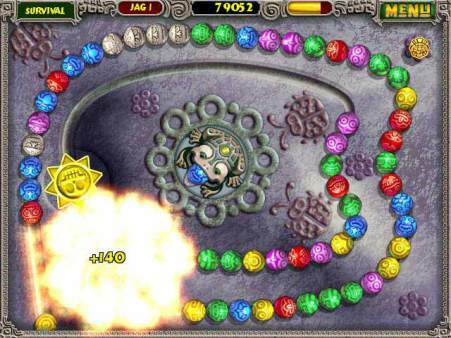 Despite the lack of variety in the levels, Zuma Deluxe was still an enjoyable game to play. People young and old will definitely have fun with it, mainly because it's simple to understand and catch on to. You can download Zuma Deluxe for your PC here: Amazon. Drool-Worthy Shoes By Robert Tabor Are Inspired By Food!